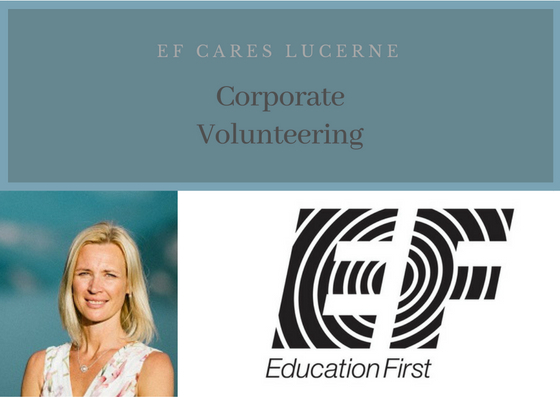 EF Cares Lucerne: Corporate Responsibility and Corporate Volunteering – an example of a well-established programme. We met with Stina Lundell, Office Manager at EF Education First in Lucerne, Switzerland. She is one of the people responsible for EF Cares Lucerne and she shared her experience with us. Stina, how did EF Cares start in Switzerland? What is the main aim of the program? EF CARES started in Boston as a service volunteer program for EF Boston staff with the goal to create relationships with local community organizations and provide a variety of volunteer opportunities. In autumn 2015 EF CARES Lucerne was started as a sister organization to EF CARES in Boston. Given that most of the EF employees in Lucerne are international, and some of them already volunteered in their hometowns, we thought that it was a good idea to create a similar program in Switzerland. Our main objective is to ensure the well-being of our employees by creating a supportive environment whereby they can interact with one another outside of the job as well as to engage with the community through volunteer activities. We offer our employees a wide range of activities, starting from after work get-togethers, ski-trips, movie nights, sport activities to in this case volunteering. It is important for EF to provide these kind of activities for employees, since most of our employees are coming from abroad and do not know anybody here in Switzerland. We want to help them feel at home in our company and in Switzerland. What are the activities of EF Cares? For the past three years, we have been organizing a yearly Christmas week, with several different activities. One of the most appreciated one has been our Holiday Box to young asylum seekers. Last year we had a record participation and were able to donate 132 Holiday Boxes. Other activities in our Christmas week has been Gingerbread House competitions, bake sales, and Zumba classes. All money collected have been donated to different organizations. Outside of the Christmas week we have been organizing Stem cell donations where employees were able to donate blood for stem cell donations and we also had a regular Blood drive and donated blood to the local blood bank. This year we are in the process of planning a spring activity. The week will be devoted to internal education on the subject environment. Which have been the main benefits for the employees? Volunteering helps employees feel more integrated in Switzerland. It is a way for them to interact and meet other people outside the office. Employees also want to give back to society; however, they do not have the time to look for organizations and activities – EF is adding value here by providing employees opportunities to volunteer. Which have been the main challenges? Our main challenge was to find organizations that would like to accept our help/volunteering in Switzerland. Given that, employees have a lot of traveling commitments, it is difficult for them to sign up too long in advance for an activity, engage and take full responsibility – since their work responsibilities have first priority. How was SIVO able to help you? We initially contacted SIVO since we did not have the capacity to research and to contact NGOs. SIVO was of great help serving as bridge between EF and the asylum centers. The first year we organized the Christmas week we drove all the way up to the Austrian border to hand out our Holiday boxes but with SIVO’s help we found Asylum centers in Lucerne for the second year. SIVO facilitated the contact and we were able to continue with the Christmas Shoe-Box Project. Thanks to SIVO’s contact, we are also able to provide our employees with other volunteering activities where they can easily enroll and participate. A very good example is the game evenings where an employee can visit asylum seekers and spend an evening playing games with them. Would you recommend other companies to participate in Corporate Volunteering activities? Definitely! it is an added value for the company. Employees like to work for a company that is profitable but also cares. In addition, it reinforces the company’s culture. About Education First: Bertil Hult founded EF Education First in 1965 in Sweden. Today EF is the world’s largest privately held international educational company. Education First specializes in language training, educational travel, academic degree programs, and cultural exchange. Headquartered in Luzern, the company has worldwide 46,500 employees and is present in 116 countries. About Stina Lundell: Stina Lundell is the Office Manager of EF Education First in Lucerne, Switzerland (400 employees). She is originally from Sweden and has been living in Switzerland for more than 4 years.